Ajitora Joins WWF in Celebrating Global Tiger Day with #‎ThumbsUpForTigers! 2016.07.29, Taipei – Ajitora, Tx2 Ambassador (http://ajitora.asia), today coordinates a youth summit at the Youth Internet Governance Camp (YIGF) camp along with a multistakeholder roundtable at the Asia Pacific Regional IGF (APrIGF) in Taipei. This series of events follows up with the earlier announcement in January 2016 setting off a movement to discuss the impact of the Internet on our wildlife and natural environment, and how the Tx2 goals exemplifies multiple facets of the Sustainable Development Goals (SDGs). This year, on Global Tiger Day, Ajitora and DotAsia are joining WWF and other Tx2 supporters in a digital global campaign launched by National Geographic explorer and artist Asher Jay. The key aim is to raise awareness about Tx2 ­ the global goal to double wild tiger numbers by the year 2022. This Global Tiger Day is particularly important as 2016 marks the halfway point of the Tx2 goal. 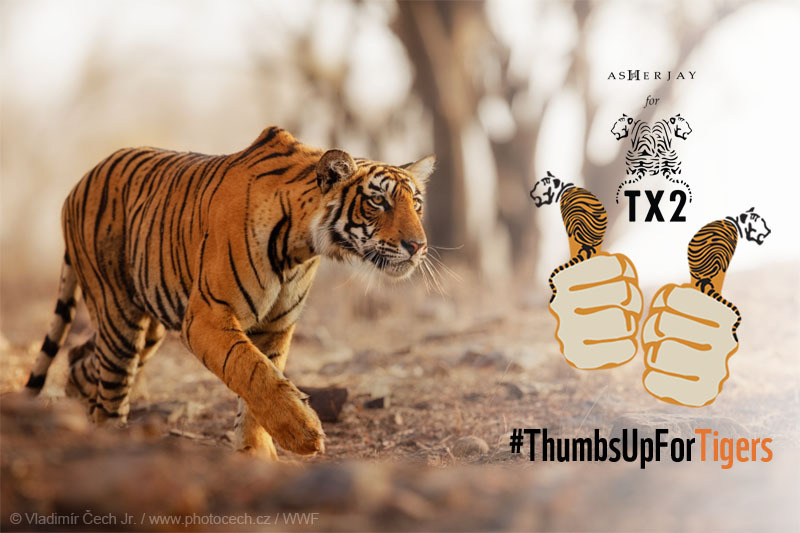 To double the number of people supporting Tx2, WWF are linking the “T” for tigers to thumbs – asking supporters to give Tx2 not just one, but TWO thumbs up! Each tiger’s stripe pattern is unique to them, just like our finger prints are to us. Supporters have posted their TWO thumbs up photo on social media with #ThumbsUpForTigers. Give us your TWO thumbs up on Facebook, Twitter and Instagram on Global Tiger Day (29th July 2016). Tigers are a symbol for Asia. Wild tiger population dropped 97% from 100,000 just a century ago, to as few as 3,890 today. Tx2 is a vision by tiger range countries (China, India, Malaysia, Indonesia, Thailand, Cambodia, Vietnam, Nepal, Laos, Bhutan, Bangladesh, Myanmar and Russia) to #doubletigers in the wild by 2022. Tx2 is supported by WWF, Global Tiger Forum (GTF), TRAFFIC, etc. Unbeknownst to many is how the Internet impacts wildlife environment. Proliferation of illegal wildlife trade online coupled with abusive mining of social media data for criminal poaching and deforestation, threaten the survival of tigers and other wildlife. Ajitora is the center point of a multi-dimensional campaign from technology, Internet policy, to consumer market engagement to support tigers and a sustainable wildlife environment in Asia.